Background: Heterotrimeric G proteins are important for numerous signaling events in eukaryotes, serving primarily to transduce signals that are initiated by G protein-coupled receptors. It has recently become clear that nonreceptor activators can regulate the level of heterotrimeric G protein signaling and, in some cases, drive cycles of receptor-independent G protein activation. In this study, we used a yeast expression cloning strategy to identify novel nonreceptor activators of heterotrimeric G proteins in a human adipocyte cDNA library. Results: The human transcription factor E2F8 was found to activate heterotrimeric G proteins, suggesting a specific biological role for this recently described member of the E2F family. Epistasis studies showed that E2F8 acted at the level of G proteins and was specific for Gαi over Gpa1. E2F8 augmented receptor-driven signaling, but also activated G proteins in the absence of a receptor. The GTPase-activating protein RGS4 antagonized the effect of E2F8, showing that E2F8's effect on Gα involved nucleotide turnover. The entire E2F8 protein was required for full activity, but the majority of the signaling activity appeared to reside in the first 200 residues. Conclusion: In yeast, E2F8 is a guanine nucleotide exchange factor (GEF) for the α subunit of heterotrimeric G proteins. The molecular mechanism and biological significance of this effect remain to be determined. One of the earliest nonreceptor GEFs to be identified was GAP-43, also known as B-50 or neuromodulin. GAP-43 is abundant in neuron growth cones and promotes axonal pathfinding during development and regeneration . Investigating the function of GAP-43, Fishman and coworkers found that it had GEF activity toward Gαo, another protein that is abundant in growth cones, and that this activity was synergistic with that of receptors [3 - 8]. More recently, a series of papers has described a diverse collection of "activators of G protein signaling" (AGS proteins). AGS1 has intrinsic GEF activity [9,10], and the mechanism of this activity appears to be analogous to the GEF activity of receptors, since receptors and AGS1 can compete for heterotrimers . AGS2–8 activate G protein signaling in yeast, but appear to do so by disrupting heterotrimers rather than by stimulating nucleotide exchange on Gα . The biological role of nonreceptor GEFs has been only minimally elucidated, but a recent series of experiments has defined a compelling function for one such molecule in a specific developmental context. Ric-8A/synembryn is a nonreceptor GEF with specificity for Go, Gi, and Gq . C. elegans zygotes undergo an asymmetric first division that requires Ric-8 for correct positioning of the mitotic apparatus [14 - 16]. Ric-8 appears to be the GEF that drives a receptor-independent cycle of GTP binding and hydrolysis, wherein each iteration of the cycle incrementally repositions the mitotic spindle . We screened a human adipocyte cDNA library to identify novel activators of heterotrimeric G proteins. 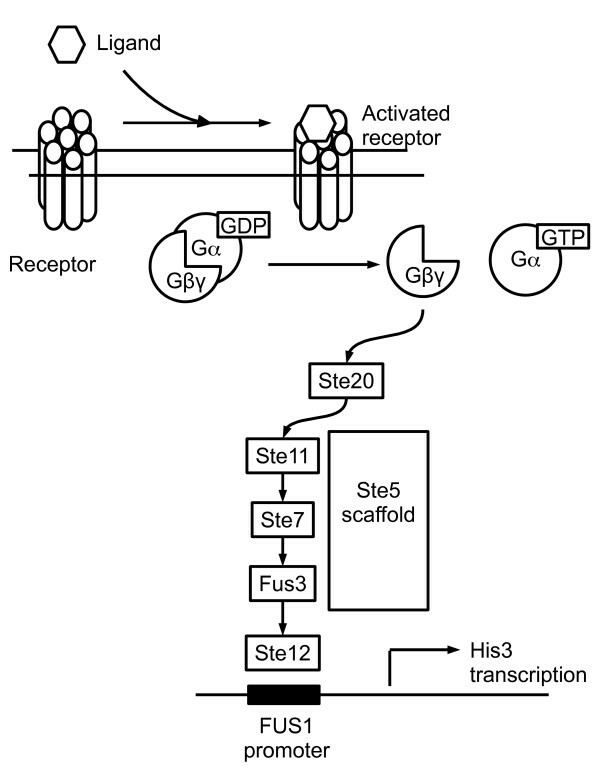 The screen made use of an engineered S. cerevisiae strain (BY1142) in which activation of the G protein/MAP kinase mating pathway  resulted in transcription of the HIS3 gene, allowing yeast to grow on medium lacking histidine (Figure 1) . Plasmids conferring histidine prototrophy were isolated from yeast colonies and sequenced; the phenotype was then confirmed by retransforming each plasmid into yeast and replica-plating on selective His-plates containing 3-amino-1,2,4-triazole (3-AT). Since 3-AT is a competitive inhibitor of the His3 gene product, the maximal tolerated concentration of 3-AT reflects the strength of activation of the reporter. The screen identified several cDNAs that would have been expected to cause G protein or MAP kinase activation, including three splicing variants of the lysophosphatidic acid receptor  and a constitutively active MEKK2 , thus validating our methodology. We also isolated three identical clones encoding full-length E2F8 [22 - 24]. subunit, was transformed with the indicated ADE2 plasmids along with empty URA3 vector. Transformants were replica-plated onto Ura-His-Ade1 mM plates containing varying concentrations of 3-AT. Yeast were assessed for growth after 3 days. The maximal concentration of 3-AT tolerated by the transformants is indicated: 100 mM (+++++++), 50 mM (++++++), 20 mM (+++++), 10 mM (++++), 5 mM (+++), 2 mM (++), 1 mM (+), or 0 mM (-). Fluorescence was determined by examining yeast colonies on a dissecting microscope and is reported as either + (fluorescent colony) or – (non-fluorescent colony). 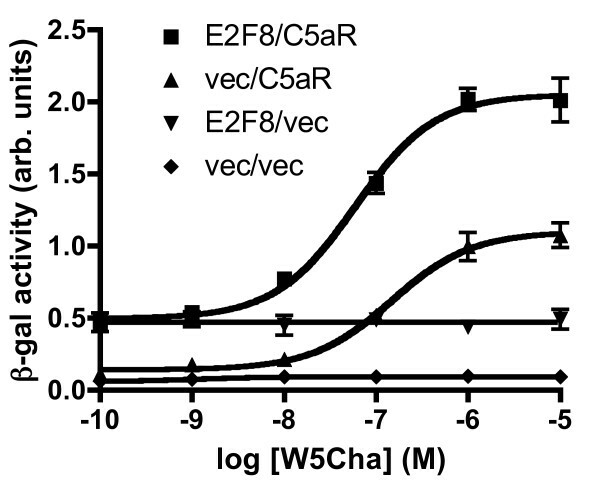 C5aR NQ, a constitutively active mutant of the C5a receptor, was used as a positive control. 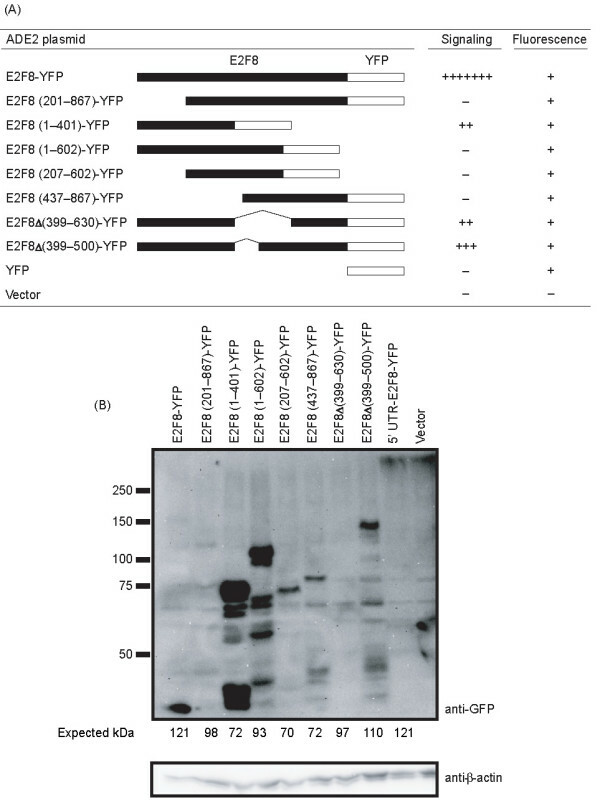 The signaling activity of E2F8 could in theory arise from activation at any level of the G protein/MAP kinase reporter cascade (Figure 1), including transcriptional upregulation of cascade components. To map E2F8's site of action, we tested it for signaling in yeast strains that were deficient for specific components of the cascade (Table 2). We found that E2F8 was downstream from receptors, since it signaled in yeast BY1142, which lacks the endogenous Ste3 gene (a-mating factor receptor). On the other hand, E2F8 was upstream of Ste4Gβ, Ste11MAPKKK, and Ste12 (MAP kinase substrate). In yeast lacking any of these components, E2F8 failed to activate transcription of the HIS3 reporter. It therefore appeared that E2F8 activated the G protein/MAP kinase cascade at a point no lower than G proteins. These screens were performed in the absence of any receptor, so E2F8 must either act directly on G proteins or act to increase the cellular level of free Gβγ. All of the yeast strains used in our studies contained yeast/human chimeric Gα subunits. Wild-type mammalian G proteins do not signal when expressed in yeast because they cannot couple to downstream components of the yeast G protein/MAP kinase cascade. Chimeric Gα subunits have the advantage that they can be activated by mammalian receptors, but can also interact with yeast Gβγ[25,26]. Strain BY1142 contains a Gα subunit consisting of 41 residues of the endogenous yeast Gα (Gpa1) followed by residues 32–354 of human Gαi3 (yielding the chimera Gαi3,Gpa1(1–41)). In this strain, E2F8 strongly activated the MAP kinase cascade (Table 2). BY1173 contains instead an α subunit (Gpa1DCGLF) identical to Gpa1 except for its last five residues, which are derived from human Gαi. The chimerism of Gpa1DCGLF allows it to interact with Gαi-coupled receptors, but in the absence of a receptor this G protein is functionally identical to Gpa1. E2F8 showed no activity when expressed in BY1173 (Table 2), indicating that it was selective for Gαi3 over Gpa1. These findings do not necessarily define the endogenous G protein coupling of E2F8, but rather indicate that E2F8 is specific for particular Gα isoforms and must therefore act at the level of Gα. We wished to determine whether E2F8 catalyzed nucleotide exchange on Gα or, instead, served to disrupt Gαβγ heterotrimers, for example by binding to Gα-GDP and sequestering the Gα subunit away from Gβγ. Either of these mechanisms would increase free Gβγ, which is responsible for signaling in the yeast mating cascade. To differentiate between these two possibilities, we determined whether E2F8's effect was antagonized by coexpression of RGS4. The GTPase-activating protein RGS4 catalyzes nucleotide hydrolysis on Gαi-GTP , thus inactivating the protein and promoting re-association of heterotrimers. If E2F8 served merely to displace Gβγ, then its effect would be indifferent to the nucleotide binding state (GTP or GDP) of Gα. In yeast BY1142, E2F8 alone allowed yeast to grow on up to 100 mM 3-AT, but when RGS4 was co-expressed, the signaling was reduced to 1 mM (Table 3). Thus, G protein activation by E2F8 requires nucleotide cycling on Gα. As a control, we verified that the signaling activity of a constitutively active GPCR (C5aR NQ ) was antagonized by fluorescently tagged RGS4, consistent with the receptor's ability to catalyze nucleotide binding on Gαi. The simplest interpretation of these data is that E2F8 increases free Gβγ by promoting GTP-for-GDP exchange on Gα. It seems unlikely that E2F8 merely stabilizes the GTP-bound state, as it can activate G proteins in the absence of receptors or any other guanine nucleotide exchange factor (GEF). G protein activation would be a novel function for an E2F transcription factor. The E2F family of transcription factors has classically been associated with cell-cycle regulation and cell differentiation [32,33]. The "activating" subgroup, E2F1–3, consists of proteins that are bound by pRb; the E2F moiety is released to serve as a transcription factor when pRb is phosphorylated by cyclin/Cdk complexes. E2F4 and 5 also bind to pocket proteins (pRb, p107, and p130) but act primarily to repress E2F target genes by occupying promoters and remodeling chromatin, allowing cells to maintain G0 arrest. E2F6 lacks the transactivation-related and pocket protein-binding domains of E2F1–5, but appears to have functions similar to the other repressive E2Fs [32,34]. E2F1–6 all bind to DNA most efficiently as an E2F/DP heterodimer . E2F8's apparent ability to activate G proteins may account for its having arisen over the course of evolution. Although both E2F7 and E2F8 have been shown to repress a subset of E2F-regulated genes and reduce cell proliferation, no special function has yet been shown for them. It may be significant that the newer E2Fs are structurally dissimilar to the previously described and well-characterized E2F1–6; unlike these, both E2F8 and E2F7 lack a DP dimerization domain and can bind to DNA efficiently in the absence of DP [22 - 24,36 - 38]. In this respect they are similar to the Arabidopsis proteins E2L1–3 . Finally, the influence of E2F8 on G proteins was identified in yeast, but this interaction must next be studied in a more physiologically relevant system. One obstacle to studies in mammalian tissue culture is that E2F8 appears to cause cell-cycle arrest when overexpressed [22 - 24]. Likewise, in our efforts to make stably transfected mammalian cell lines, E2F8 was lost within a few passages (data not shown). An inducible expression system could be a useful workaround, but it would be equally valuable to investigate the role of E2F8 in a system where it natively plays a demonstrable biological role. Given that E2F8 was cloned from a mature human adipocyte cDNA library, adipose tissue appears to be an interesting starting point for this effort. Yeast strain BY1142 has genotype MATα far1Δ1442 tbt1-1 PFUS1-HIS3 ste14::trp1::LYS2 ste3Δ1156 Gαi3,Gpa1(1–41) his3 leu2 lys2 trp1 ura3 can1 ade2. Yeast BY1173 has genotype MATa his3 leu2 trp1 ura3 can1 gpa1::ade2::3 × HA far1::ura3 fus1::PFUS1-HIS3 LEU2::PFUS1-lacZ sst2::ura3 ste2::G418R trp1::GPA1DCGLF. Yeast strains with deletions of STE4 (BY1187), STE11 (BY1206), or STE12 (BY1207) were derived from BY1142 by gene replacement in our laboratory. Yeast were transformed by the lithium acetate procedure or by electroporation and were grown on selective media at 30°C. Fluorescence of yeast colonies was determined by examining them at 500× magnification on an Olympus SZX12 dissecting microscope with a mercury-arc light source (Hitschfel Instruments) and YFP or GFP filter set (Olympus). For the growth assay, selected yeast colonies were streaked onto a master plate (Ura-Ade-), then replica-plated onto selective plates (Ura-His-Ade1 mM) containing increasing concentrations of 3-AT (Sigma). The minimal concentration of adenine in the selective plates allowed us to use color selection to ensure that signaling was plasmid-dependent: if a reporter pathway mutation arose — allowing plasmid-independent growth — and the ADE2 plasmid was lost, yeast still grew on minimal adenine medium, but developed a red color that allowed those colonies to be excluded from consideration . For β-galactosidase assays, yeast were grown in liquid culture and seeded into microtiter plates (Costar) at an OD600 of 0.015 units/cm. The small molecule W5Cha  was used as an agonist. After a four-hour incubation at 30°C in the presence of ligand, a lysis/substrate buffer was added (final composition 0.5% Triton X-100, 1 mg/ml chlorophenol red β-D-galactopyranoside, 25 mM PIPES, pH 6.8) and color development was allowed to proceed for fifteen hours, then was stopped by addition of Na2CO3 to 0.2 M. Color was assessed by measuring OD570 on a Bio-Rad plate reader, model 680. Jones, EW and Fink, GR (1982). Strathern JN, Jones EW, Broach JR ed. The regulation of amino acid and nucleotide biosynthesis in yeast. The Molecular Biology of the Yeast Saccharomyces: Metabolism and Gene Expression. Cold Spring Harbor, N.Y.: Cold Spring Harbor Laboratory, pp. 181–299.